(Office of Her Majesty – Press Department – New York) - Her Majesty Queen Rania Al Abdullah said that the burden of the Syrian refugee crisis cannot fall on the countries closest to the conflict to shoulder alone, adding that how the international community decides to respond to this crisis now will shape the world for decades to come. 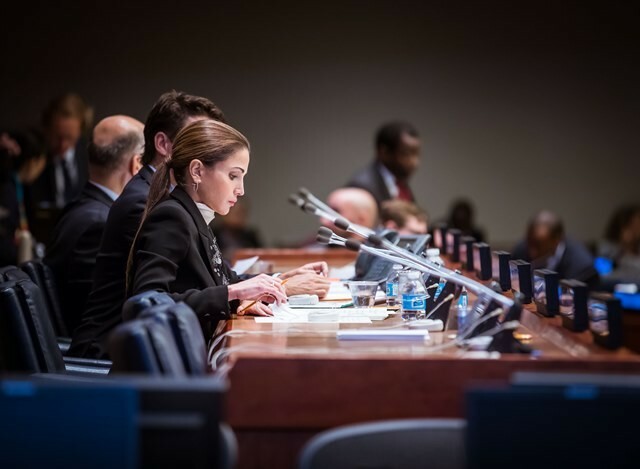 Queen Rania made these remarks in her capacity as a humanitarian advocate during a roundtable on international action at the UN Summit on Refugees and Migrants on Monday, while on a working visit to New York with His Majesty King Abdullah. The high-level summit aims to address large movements of refugees and migrants, and bring countries together to hash out a more coordinated approach to this worrying global trend. In her remarks, the Queen highlighted the need to strengthen global collaboration and partnerships in responding to the Syrian refugee crisis. Her Majesty recalled the record high global forced displacement of more than 65 million people, describing it as “a record of tragic proportions. “Millions of people have had the misfortune of being born in a place so wracked by violence, poverty, persecution, or insecurity that they had no choice but to leave,” the Queen said. This is why she called on the audience to partner across sectors in order to empower refugees and enable them to become independent, so that they can to contribute to the economy, and eventually rebuild their homelands. In her remarks, the Queen also emphasized Jordan’s reputation as the world’s second largest host of refugees per capita. “I could not be prouder of the generosity my countrymen and women have shown,” Queen Rania added. While also commending the generosity of the international community, Her Majesty explained that it is still “no match for the towering need,” with foreign assistance to Jordan barely covering one-third of the cost of hosting refugees. But the Queen added that Jordan is determined to “craft opportunity from crisis” through initiatives like the Jordan Compact. The compact offers a long-term solution to the refugee crisis by creating income-generating opportunities for the vulnerable to support themselves, instead of relying on dwindling handouts. “In 18 Special Economic Zones across the country, private companies that put down manufacturing roots will now have greater access to the European market and investment incentives, while creating jobs and training opportunities for both Syrians and Jordanians,” Queen Rania explained. But for this pilot program to succeed, “we need to work together – public and private, humanitarian and development, donor and host,” Her Majesty added. The roundtable was co-chaired by Jordan and Canada, with the participation of representatives from twenty nine other countries. Later on Monday, Queen Rania also participated in the Clinton Global Initiative Annual Meeting, as a panelist at a plenary session titled “Succeeding in the World’s Toughest Places." She spoke alongside Western Union CEO, Hikmet Ersek, and the Prime Minister of Sweden, Stefan Lofven at the session that was attended by one thousand people. During the panel, the Queen underlined the devastating challenges facing refugee host countries like Jordan. She described the scale of the Syrian refugee crisis as overwhelming, and called the global response to it disproportionate. Her Majesty also revealed that the world’s six wealthiest countries, accounting for up to 60% of the global economy, host less than 9% of the world’s refugees. In contrast, more than half live in countries like Jordan, which make up less than 2% of the world’s economy. She added that due to low levels of international funding, Jordan has had to spend up to a quarter of its budget on the needs of refugees, raising the country's debt to GDP ratio to 94%. At the heart of the Queen’s message was the need to recast the global debate about refugees on the grounds that the crisis has become part of the new global reality. Her Majesty warned that failure to do so will continue to polarize politicians and populations. Queen Rania explained that the narrative around refugees, which is supposed to be fundamentally humanitarian, has been transformed into something so political, and exploited to garner popularity and votes. The Queen said that despite a public outcry, "little has changed in the world's appetite in dealing with the refugees in meaningful ways." "One thing that I find frustrating is that most leaders are stuck in linear modes of thinking and in traditional approaches, or are consumed by very urgent issues like votes and short-term politics that they do not think of the disruptions happening in the world," Queen Rania said. She concluded by stating that "at the end of the day this is about people and values. We have to create a future that works for all of us by putting people front and center." Since its founding in 2005 by President Clinton, the Clinton Global Initiative has convened global leaders to create innovative solutions to the world challenges by bringing together current and former heads of state, NGOs, CEOs, philanthropists and Nobel Prize laureates.